E Instruments Announces New Commercial and Residential Combustion Analyzers Available. Potential clients that are looking for the most accurate, reliable, and robust combustion analyzers can choose E Instruments' BTU1500 model or their BTU900 model. In regards to their BTU1500 model, this model offers an easy-to-use interface as well as a built-in printer. What's more, this model offers a large full color graphic display, Bluetooth connectivity, and is able to read gases such as O2, CO, and CO2, as well as detect changes in temperature. Those who purchase this model will also receive a manual and carrying case. E Instruments' BTU900 model features an incoming air temperature probe, unbreakable metal connections and can read up to 10 different fuel/oil types. Just like that of the BTU1500 model, this model also has Bluetooth capabilities and the ability to connect to a PC via a USB connection. Businesses looking for a state-of-the-art residential combustion analyzer can opt for E Instruments' BTU1100. This model comes with a built-in internal impact printer that uses non-thermal paper rolls for easy printing of data, has pre-calibrated gas sensors, and can read up to 10 different fuel/oil types. 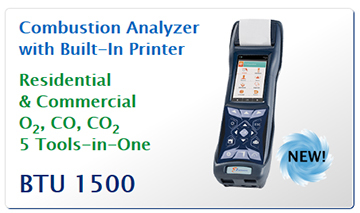 Businesses that are looking for top-of-the-line combustion and emissions analyzers can turn to E Instruments. The company is always looking to provide HVAC professionals or concerned homeowners with even better ways to detect gas leaks before they turn into a major issue. To learn more about the company and see the latest products added to their inventory, please visit their website today. E Instruments International manufactures and markets a complete range of innovative instrumentation solutions encompassing Combustion Gas Analyzers, Indoor Air Quality, Calibrators and Test & Measurement equipment's especially designed for the power, process, industrial, institutional, food, and HVAC markets. E Instruments Calibration Laboratories provide high quality calibration services in a prompt and timely fashion. E Instruments services include Gas Calibrations using EPA protocol gases and NIST Traceable Calibration services in our ISO17025 accredited laboratory. Customer Support and Applications expertise are fundamental to E Instruments' success.